District 704 Home Furnishings always offers simple to get, simple to use financing. Our programs often allow you to make payments while deferring interest, and always provide you benefits when shopping with us. Ask us for details when you visit our store. A Synchrony credit card gives you the flexibility to pay for your in-store purchases over time while you enjoy your new furniture now. 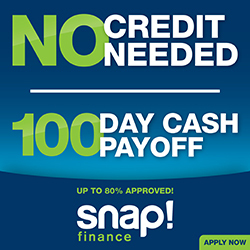 District 704 Home Furnishings offers "ZERO DOWN" AND "0%" INTEREST with approved credit for either 12 or 18 Months. Please note Special Financing can only be processed in-store, this payment method is not available in the on-line checkout. We approve up to 80% of applicants - whether you have poor credit from bankruptcy, no credit or bad credit scores, like so many others. It's simple, and applying online is lightning fast! Just apply online. Easy Online Application – Here’s how it works! Verify that you meet our criteria. *See store for details on Snap Financing.